Capt. 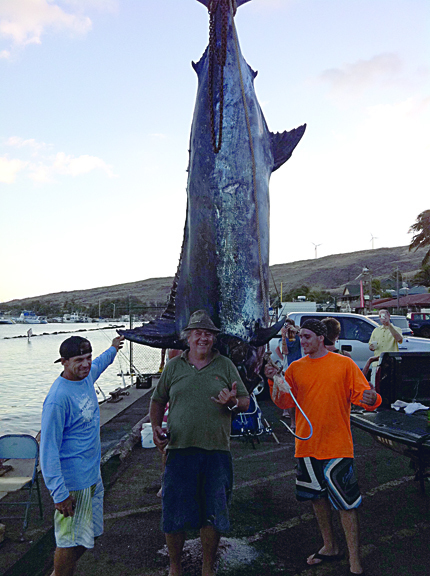 Francis Phillips of the TRES' MARIE used a homemade wooden teaser shaped and painted like a mahimahi to raise their 1039.6-lb marlin. The marlin then attacked a Marlin Mgic Ruckus Digga Jet attached to a 12/0 Penn Senator reel loaded with 130-lb test Maxima line even though it had a 30-plus-lb spearfish half-digested in its throat! The marlin put up an epic battle with numerous runs under the boat getting the line treacherously close to the props and finally diving into the depths and expiring.